Geo. Nesbet & Co., Ltd.
Newbigin Steam Ship Co., Ltd.
New Medway Steam Packet Co.
Newry & Kilkeel Steam Ship Co., Ltd.
New Zealand Shipping Co., Ltd.
North Lincolnshire Steamship Fishing Co.
North of Scotland and Orkney and Shetland Steam Navigation Co.
North Yorkshire Shipping Co. Ltd. The National Benzole Company ran a fleet of small tankers between the 1920's and the 1950's - the firm now just runs garages in north of England. The National Line (National Steam Navigation Company) was a Liverpool shipping company which existed between 1863 and 1914. Established in Liverpool in 1863 with a view to link this port to the Southern US but changed to New York because of the Civil War. In any case the idea was to use iron screw steamers transporting cargo as well as passengers (emigrants, mainly). Competitors were Cunard, Guion, Anchor and Inman; the National Line did rather well till about 1880 thanks to its emphasis on freight and numbers of passengers (large ships) rather than speed. Other ports linked were London-New York (1870) and Boston. National Line had twelve ships in 1879, four of which were then commandeered for the Zulu Wars. One moment of glory occurred when the ‘America’ – for two months – held the Blue Riband (1884). The sailings to New York were discontinued in 1892. In 1896, the Atlantic Transport Line took over National Line which would only carry freight from then on, as it had already done on the London-New York route anyway. The end came in 1914 through voluntary liquidation. The house flag is red, a white cross throughout and a union jack in the centre, as shown at www.mysticseaport.org, No. 1804 ‘National Steam Ship Co., Ltd., London’. National Power PLC., London - white flag, blue disk, charged with red "P" and a white N resembling a lightning flash. The Maritime Timetable Images site features Nelson Line aka ‘Nelson Steam Navigation Co.’ A flag drawing from the first poster (clickable), presenting Sailings September-December 1924, shows a seemingly tapering swallowtail, red, bearing small white diamond with black initial ‘N’ – here, it almost seems blue (and on the second poster the swallowtail seems orange). Confirmation of colours (without tapering however) in the on-line 1912 Lloyds Flags & Funnels, no. 1752, ‘H. & W. Nelson, Ltd. (Nelson Line), Liverpool and London’. Incidentally also shown by Flaggenbuch 1928 II, as no. 396 ‘Nelson Line, Ltd, London’ with black initial, no tapering. The shipping line was founded to help expand the meat business of Hugh and William Nelson, sons of James, butcher and breeder. Experiments in refrigerated transport from family-owned meat company in Argentina to Great Britain. A number of ships were registered as separate firms managed by the Nelsons, merged into ‘Nelson Line (Liverpool) Ltd’ in 1898 becoming ‘H. and W. Nelson Ltd’ three years later; in the same year (1901) limited passenger transportation started as well. 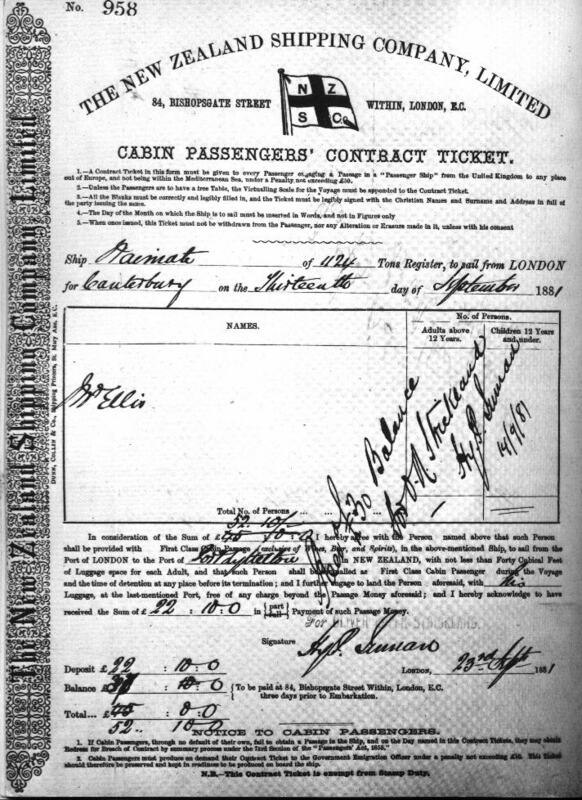 ‘Nelson Line (London) Ltd’ formed in 1910 for passengers, new ships to be brought under control of ‘Nelson Steam Navigation Co. Ltd’. Nelson companies bought up by Royal Mail Steam Packer in 1913 but retained funnel and flag. Serious losses during WWI. Only ‘Nelson Steam’ remained in 1925. Newly formed company Royal Mail Lines took over Royal Mail Steam Packet, Nelson, and other companies in 1932 – and that was the end of the Nelson house flag. There appears be no connection found with ‘Nelson & Co.’ at Liverpool flying a completely different flag (Griffin 1891). George Nesbit & Co. Ltd. Originated as Nesbit, Calder & Co. with a similar flag but swallowtailed and with the blue letters "NC", [one source says black], the red bands being shown as narrower. Lloyds Book of House Flags and Funnels (1912) shows the house flag of "Netherton Shipping Company (John Greenless & Co.)" (#83, p. 40), a company based in Glasgow (Scotland), as quartered per saltire blue-red with, in the middle, a white disk charged with a red "N". "Castlehead in its heyday had several major players in the shipping industry. If that seems surprising today, bear in mind that until two thirds of the way through the twentieth century the Clyde was one of the world’s busiest ports. Every shipping line worthy of the name had offices in Glasgow and there were scores of ship managers and brokers to handle the business of the smaller fry. It was a lucrative business, and Castlehead’s moguls did not miss the opportunity. The Greenlees at Netherton (26 Main Road) were related to the J. & P. Coats dynasty and their own family fortune was based on Rule and Greenlees, large-scale manufacturers of cotton and gingham clothing in the East End of Glasgow. It was a natural progression for major importers of textiles from the Far East to run their own ships and they set up the Netherton Shipping Company." Postcard #10, 2nd row, 1st flag of the collection reads "Newcastle Steam Ship Co." and shows a white flag with three black lozenges throughout, set side-by-side. A British company. Postcard collection reads "New Medway Steam Packet Co." and shows a ~2:3 vertical bicolor of very dark blue and dark red with a large white outlined of a rearing horse facing the fly. When presenting the British excursion boat company ‘New Palace Steamers Ltd’, however briefly, its predecessor or parent company ‘Palace Steamers Ltd’ (founded 1888) should be mentioned. Besides taking over the ships of a failed Thames competitor, Palace Steamers had three large ships built: ‘Koh-i-Noor’, ‘Royal Sovereign’, and ‘La Marguerite’ but these were to be owned by separate companies and operated by the related ‘Victoria Steamboat Association’ to service the SE coast or cross the Channel. When these fine ships turned out to be not only popular but very costly as well, they were retaken by their shipbuilder Fairfield and operated under the name ‘New Palace Steamers Ltd’ (1894). One vessel was sold in 1904, the two others in 1918. The house flag – a pennant, really – is shown on a postcard (drawing), the first image on this informative and well illustrated page at http://www.simplonpc.co.uk/NewPalace.html. It is a white field with blue cross edged yellow, serifed red initials in the corners: ‘N’ (upper hoist), ‘P’ (upper fly), ‘S’ (lower hoist), and ‘LTD (‘TD’ smaller and raised, placed above a dot; lower fly). Newry & Kilkeel Steam Ship Co. Ltd. This is the flag of Joseph Fisher & Sons Ltd. dating from 1897. For a long time they traded through the Newry & Kilkeel Steamship Co. Ltd. and, earlier, the Frontier Town Steamship Co. Ltd. By the mid 1960s the ships were only under their own name and they eventually faded from Lloyds around the early 1980s. From the website of the National Maritime Museum, "the house flag of the New Zealand Shipping Co. Ltd, London. A white flag with a red cross and the black initials 'NZS Co' in the quarters. A pennant divided vertically into red white and blue above. The flag and pennant are made of a wool and synthetic fibre bunting. They have cotton hoists and are machine sewn. The pennant and flag are on a single rope with a toggle attached. The pennant was originally a 'steam cornet' flown to indicate that the vessel was proceeding under steam as well as sail. It was added to the house flag when the company acquired steam assisted vessels." The letters are blue according to Brown (1951) and Loughran (1979), and I think on the real flag too. New Zealand Shipping Co. Ltd., London: white, a red St George's cross and blue letters (without serifs) in the corners: `N' in upper hoist, `Z' in upper fly, `S' in lower hoist and `Co' in lower fly, the `o' raised (no dot). Above this flag, a pennant vertically divided red-white-blue, the height being one half of the flag's and slightly extending beyond it, say one fifth of its own length. You can read more about it in this pdf file. And the same flag, without pennant, on this document. Based on Larousse Commercial Illustré (1930). A postcard collection shows a card that reads New Zealand Line and shows a white flag with a red cross throughout with (light?) blue letters reading "N", "Z", "S", and "Co", on each quadrant (host-fly, top-bottom), and a red, white, and blue vertical pennant hoisted above the flag. The pennant is much smaller (about 2/5ths of the flag's height, and the same length) than reported from the National Maritime Museum [shown above]. From the website of the National Maritime Museum, "the house flag of Niarchos Ltd., London. A white flag with a narrow horizontal band striped red, white a blue across the centre. In the middle is placed a large, black-bordered 'N'. The flag is made of a wool and synthetic fibre bunting. It has a cotton hoist and is machine sewn. A rope and toggle is attached." Loughran (1979) shows nearly an identical flag for Niarchos Group, Athens; Hellenic Shipyards Co. Ltd., of Piraeus, is part of the empire of Stavros Niarchos, and uses his flag and funnel. James Nicoll & Co., Dundee. The flag is white with a border red (top and left) and blue (bottom and right) and N.D. (blue) in the middle. Nomikos (London) Ltd, London - Israeli-style flag; in center blue cross formy. Norships Ocean Carriers Ltd. This is one that you may wish to toss a coin as to what name it should be shown under. In Brown 1951 it is recorded for Ship Finance & Management Co. Ltd. They operated various companies, several of which had name beginning with "N" and ships with a 1st name of "Lord" indicating that they were connected and probably were subsidiaries. Norships Ocean Carriers Ltd. do not appear in Lloyds Shipowners 1953-4 but one company in the above category, Norwood Steamship Co. Ltd., does and this explains why Stewart 1953 and 1957 show the livery for both Ships Finance & Management and Norwood Steamship. By 1958 the companies operated by Ships Finance & Management appear to have been consolidated into Norships Ocean Carriers Ltd. which explains why Stewart 1963 and US Navy record it under that name (ignoring the operator). By the beginning of the 1970s the fleet appears to be under Norships Freighters Inc. with all other names, including Ship Finance, disappeared from the scene. The answer to all this, it seems, is one of the "London" Greeks, George Nilcolaou Ltd., being behind everything, certainly noted as agents for the last mentioned company and actually shown by US Navy 1961 as well for the livery but under the Greek section despite domiciling in London. North East Towing Ltd., Newcastle-upon-Tyne - white flag, black connected "NE". Lloyds Book of House Flags and Funnels (1912) shows the house flag of "North Lincolnshire Steamship Fishing Co., Ltd. Co." (#287, p. 50), a company based in Grimsby, as blue with a white ring charged with a white "L" in the middle. The flag is horizontally divided blue-white-blue. North Sea Ferries, Hull - diagonally divided, blue in lower hoist, white in broad stripe in centre, white in upper hoist. Blue and light blue separated by thin white bar. On light blue panel and oval logo showing a stylized ship made of horizontal white lines on a dark blue sea. From the website of the National Maritime Museum, "the house flag of the North Thames Gas Board, London. A white flag with a red rising sun motif in the centre and the black letters 'NTGB' in the corners. The flag is made of a wool and synthetic fibre bunting. It has a cotton hoist and is machine sewn. A rope and toggle is attached." Brown (1951) shows shows the same flag with blue letters. Lloyds Book of House Flags and Funnels (1912) shows the house flag of "Northwold Steam Fishing Co., Ltd" (#321, p. 52), a company based in Grimsby, as red with a white "W" inscribed in a white ring. From the website of the National Maritime Museum, "the house flag of the North Yorkshire Shipping Co. Ltd., London. A green flag with a white rose in the centre. The flag is made of a wool and synthetic fibre bunting. It has a cotton hoist and is machine sewn. The design is printed. A rope and toggle is attached."